This week for Photo of the Week, we would like to feature a stunning compilation of some of the brightest planets in our night sky. Taken by the talented photographer Agustí Ortoneda using a Skywatycher200 and an ASI178mcc with the aid of a 2x barlow lens, this lovely photo features the planets Mars, Jupiter and Saturn. 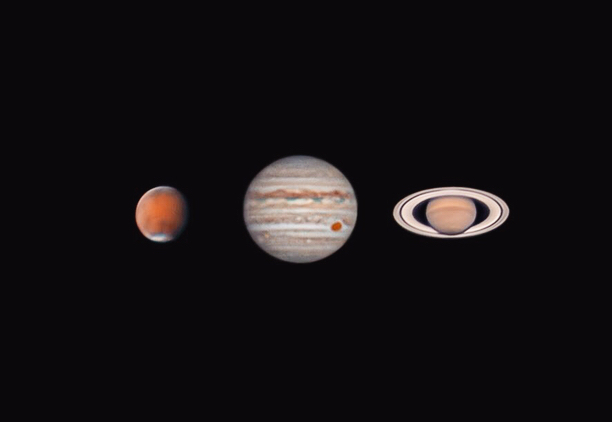 What makes these planets unique is that all three of these planets' oppositions took place in a span of less than 80 days. Jupiter's opposition occurred on May 8, followed by Saturn's opposition on June 27. Mars' opposition took place yesterday on July 27 in conjunction with the longest lunar eclipse of the 21st century. Even though all of these oppositions have passed, the three planets will still be bright in the night sky for many more days to come this summer so be sure to take the opportunity to take a good look at these three planets, along with the planet Venus, during the early and midnight skies.